When I first came up with the idea for this particular post it was about late last year, I had just read an article on Forbes (.com) about the numbers of businesses owned by men and women of color, and how they are improving although they are still not balanced with the population percentages. Due to the diversity in the millennial generation, which is the most diverse generation in history, startups have seen an increased in diversity in ownership. Latino business owners account for 20.8% of all new entrepreneurs—more than double the rate back in 1996. Why is this so important? Well, they create jobs. They serve the community. They improved the economy in our neighborhoods. And they are inclusive! “New startups account for at least 50% of all new jobs created, they drive innovation, and they contribute positively to local economies.” These are the businesses and people shaping our future. I have a lot of colleagues and friends who not only want to support minority owned business but even leave their corporate jobs to work for more diverse entrepreneurs. That is a lot to say of how aware we are becoming of our power and how our influence helps move the needle in our favor to create these necessary changes. For this reason I decided to reach out to some entrepreneurs who I admire their focus on communal impact and the risk they take in running their own business. In doing so I learned so much about the lessons business owner of diverse backgrounds learn along the way. We spoke about their growth and the impact their brands have made, and how, we as supporters, can make a difference in how our store fronts and offices can look like in the near future. It was summer of 2011, I arrived to Van Cortlandt Park along side a swarming amount of people all headed the same way. It was RocFam’s annual BBQ and everyone was pulling up ready for a great time, amazing music set, and the joy of running into everyone you hadn’t seen in years. But one of this BBQ’s best feature was the food! This is when I first heard of Jason Alicea who catered his crew’s BBQ. Fast forward to close to 8 years later, through his hustle and passion for the culinary arts, now I get the opportunity to meet Jason again. Now he is owner of Empanology, an empanada food truck turned local restaurant, and location for many community events in the South Bronx. 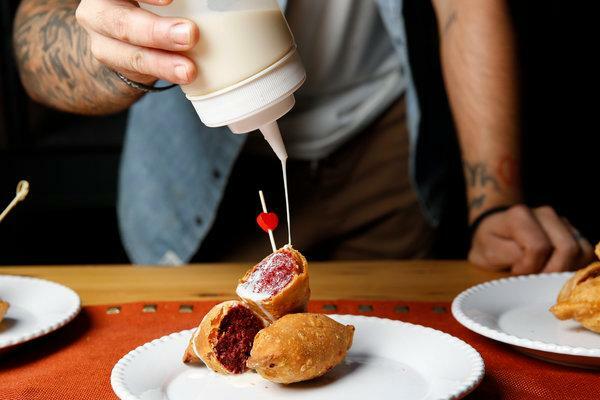 Empanology serves empanadas with a culinary twist while still tied to his Newyourican culture. Just try the chopped cheese empanada and you will understand! Since then Jason attended Culinary Management School to learn what it takes to have a successful establishment. Through this experience he was able to network and acquire the skills needed to build a business plan and understand that being numbers oriented was as important as the quality of the food in a restaurant business. Back in November I sat down with Jason as he was preparing his Thanksgiving Community Dinner where he allowed anyone in need to come in and get a free meal. Jason shared with me his journey and his vision for the future of Empanology. Born and raised in The Bronx, Jason has been a first hand witness to the development of the area and all the new businesses that have emerge. Opening Empanology here was an easy choice for him as he always wanted to keep it close to home. Fortunately for him the timing couldn’t have been better as his business now a staple in the growing and revamping of what the South Bronx will be. This same neighborhood is what he credits his success to as he has been privy enough to have the support of his peers and his neighbors, especially his church which holds service a few times out of the week from the Empanology location. Long term his goal is to create a Culinary Arts program to expose others to more career options. With the help of his wife, who is a local Principal, he is working on an after school program for ages 11-12 as a pilot of what he wants his own institution to be. Jason expressed he wants to “be the person [he] didn’t have.” Someone to mentor and expose him to more than what is sensationalized. What is even more amazing about this story is that when you walk into Empanology you see the same friends from the RocFam BBQ now helping to run his business. Empanology is not just a spot to get a quick bite. Sip and Paint, Suicide Awareness, Thanksgiving Drive, open Mic Events, and Church Service are just a few of the community events held at Empanalogy. As a true believer of his mission to spread the opportunities in the culinary arts, I encourage you to stop by and support his dream. Jason has provided employment for his peers, a safe haven for those in need, and his ultimate mission to create a culinary school is something The Bronx can greatly benefit from. I’ve been to Puerto Rico about three times and just love the country and its people. I’ve always had the most amazing experiences there and recommend it to people all the time. When Hurricane Maria destroyed a major portion of the island and left it in a very dire state I was really moved emotionally and spiritually. I wanted to help. Through social media I saw a post promoting an event at The Bronx Native, which at the time was only a pop up shop. In collaboration with PR WE ARE 1, they were accepting donations to ship out to PR. I went to drop some donations off and was able to meet the owner Amaurys. I quickly realized this wasn’t any regular shop. This was another community staple soon to become landmark. On this night I became a fan of the brand and the mission behind it. This year I spoke to Amaurys about how diversity played a role in his growth as an entrepreneur. “If it wasn’t for my background, born here but of Dominican parents, and feeling like in the middle of both, not fully American and not fully Dominican.” Amaurys found his identity within his South Bronx upbringing. With it’s mix of cultures and incredible pride, The Bronx is what he related to the most. He went to the School of Visual Arts where he was the only Bronx native amongst predominately White and Asians classmates. With that experience he went from trying to assimilate and relate to fully embracing his difference and using that to his advantage. By embracing The Bronx he found himself and the love others had for the birthplace of hip hop. Bronx Native is a socially conscious brand that is set out to embrace the beauty and pride of The Bronx while changing the stigma’s around the borough. No longer a pop up shop, but a permanent location, the Bronx Native has gained notoriety for being first the first of its kind. The Bronx Native now can be seen featured in Bronx’s own Desus and Mero’s show, NY1 , NY POST, and most recently had their own episode on Viceland’s The Hustle Show. The brand is doing it’s due diligence to make sure it is here to stay. When asked what can we do to keep them striving Amaurys explained that he understands not everyone can constantly buy merch but they can easily support. Now through social media we can all help build brand awareness. The Bronx Native is not only influencing our style but our diverse community through charity work like their Christmas Toy Drive, political influence like helping Alexandria Ocasio-Cortez on her road to Congress, and always keeping the arts alive with various open mic events. So when you see these events I encourage you to always like, share, and support, but also buy merch when you can! How did I meet Chris and Duna? Blank thoughts. Why? Maybe because it was the start of many epic nights with this team. And each night would trump the latter. What became an instant collaboration of minds, the Morir Soñando team collaborating with Velvet Ropes made perfect sense because we both shared the same passion and spirit of good vibes + giving back, which always means a great time. Since our first meeting we have supported one another and collaborated on two successful Back To School events that exceeded our expectations. Collecting an amazing amount of school supplies we were able to provide children in the community and in foster homes the tools they needed to start a great scholar year. Even though they know how to bring a crowd together, that isn’t what sets them apart from the rest. Velvet Ropes has stayed consistent in their solidarity to each other and their devotion to changing what it means to be from Uptown. Childhood friends created this business to provide experiences full of unity and love. Their events embrace their diversity and highlight their culture. ”Velvet Ropes Group was started by the people and for the people.” They credit their team’s diversity for their growth and opportunities. On a first hand account I have seen them provide endless opportunities to those from the community. From the DJs to the photographers and even venues they use, they always make it a point to hire and use services within the community. Velvet Ropes always wants to provide the community with unlimited resources, jobs, income and opportunities. When asked on how can we continue to help their growth they shared that they just want people to come and experience their events. Their brand is the community that comes out to create the vibes. They pride themselves in being for the working class that is not only looking for a good time but an opportunity to network with like minded individuals so more opportunities sprout from this. The ‘mom and pop’ version of local businesses has been revamp. The you and Is of our communities are the ones that are taking risks to make impact in our neighborhoods through way of our own personal passions. These are just 3 businesses from entrepreneurs of diverse background shaping our future and I encourage you to look into more. Support comes in various forms and it is essential to the future of a business. We want to see more of our people be part of various industries to help open doors, create opportunities, and create the inclusive environment we have been lacking but without our support their future is provisional. We can support with our dollars, but also with our social outreach. Like and share all the great things these business are doing. How ever you can let’s commit to helping these risk takers shape how our communities look in the future.